Share the post "Thoughts for the synod"
Let us hope and pray that the participants in the synod in Rome are mindful to the signs of the times and to the promptings of the Holy Spirit. Share the post "Positive Sacrifices for this Lent by Monsignor Ferrarese"
Lent begins late this year (on March 6th), so we have a little time to do some planning with regards to the oft spoken-about concern: “What am I going to do for Lent?” Lent is a time to get our spiritual house in order beginning with the things that influence our bodies. There was a time in the Church’s history that people engaged in some pretty tough forms of sacrifice: using whips and other instruments of administering pain, or at least discomfort, to the body. The idea behind these was to ‘mortify’ the body—that is, to put it into subjection to the soul. “Mortify’ literally means to ‘kill’ the desires of the flesh. The great saints have often engaged in these extreme penances that sometimes were factors in their early deaths (St. Anthony of Padua died at 36 years of age). I don’t choose to look down on these efforts. These saints were incredibly generous to the Lord in their sacrifices. But I am suggesting doing things that require great sacrifices, but that will actually add time to our lives on earth; not just to enjoy life, but to have more time to serve the Lord. Could you imagine how much good St. Anthony could have done if he had lived to 80 or even 90 years of age! I remember a few years ago a young seminarian coming to me with a question. He asked me if I knew where he could purchase a ‘hair shirt’. Hair shirts are shirts made of a kind of burlap that, when worn by the naked skin, caused terrible discomfort and could lead to open wounds on the skin. It was used previously to mortify the flesh and provide a sacrifice that someone could do for God. I asked him why he wanted to use one. He replied that he wanted to show God how much he loved Him by offering the pain as a sacrifice. I told him that the hair shirt was not used anymore because it caused serious health problems. I suggested instead that if he wanted to offer God a sacrifice, he should join a gym and begin an intensive training course to become healthier so that he could serve God longer and in a better way since he would be healthier and God would be served better. The hair shirt might curtail his service unnecessarily! He went away saddened since he had sort-of romanticized the hair shirt worn by the great saints. He did not join a gym! My main point in using this example is that we should not hurt the body that God gave us, but we can train it to serve God better. Lent, for some, is a time for self-improvement. This is a misunderstanding of Lent. You can improve yourself, but always for the honor and glory of God, not for our own pride or good looks. There is a difference between fasting and dieting even though the end result is the same. But at the same time, it does not mean that what we sacrifice for Lent need hurt us or disrupt the work we are to do for God. Somehow, we must yoke together the goal of the honor and the glory of God and the disciplining of the means to that end. The discipline must never contradict the goal of our Lenten striving. Finally, the one thing we can learn about the extremes that the saints employed is to have great generosity of heart. They were willing to give God everything, even to the point of their health and comfort. We have to try while keeping in mind the discipline of our methods not to succumb to the spirit of our age that places convenience and comfort almost as ultimate values. We have to always try to go a little further in our sacrifices so that we constantly challenge ourselves to leave our comfort zones and give God as much as we possibly can. Lent is really a joyful time when we can give God everything that we are. We have but to give Him what we value most in life since all comes from His love for us anyway! Share the post "Deciding Who Is a Human Being by Monsignor Ferrarese"
Sometimes a principle needs to re-expressed for its importance to be seen: It is an article of our faith that God creates each human being in His image and likeness and that from the womb he directs and creates and sanctifies each and every human being. Every human person has an intrinsic value that cannot be bartered or diminished by accidental circumstances. The minute human beings start deciding who is human and who is not, we have big problems. The Nazis decided that non-Aryans, and especially Jews, as well as handicapped people, were not “life worthy of life” (their horrible phrase). Thus, the holocaust became necessary and even a good thing for Germany. In Africa, the Hutu tribe decided that the Tutsi tribe were nothing but ‘roaches’ (again, their horrible term) so it was logical to stamp them out. And now our own New York State will pass a law that says that at any time when the mother decides that her infant is not human, doctors could dismember and kill it, even on the day of birth. This is called ‘reproductive choice’ (our term). How did we get this way? Just like at the basis of all physical phenomena are mathematical formulae, so at the basis of all ethical issues are philosophical ideas. When these ideas are false or in error, they have huge ethical consequences. At the basis of this ethical tragedy is the philosophical move to subjectivism. By that I mean: Things are not objectively real. They are what I subjectively want them to be. So if I do not want to be 49 years old, I can change my age, or my gender or my ethnicity. I am who I want to be. You hear this in the movies: you can be anything you want to be; you just have to believe in yourself. While there is a subjective component in all of our perception of reality, it does not change reality. This bedrock philosophical assertion is widely contested and forms the basis of this decision to define the human according to our personal way of seeing. So the Nazis wanted everyone to believe and see that Jews were fundamentally different and irretrievably deficient and even dangerous to the common welfare. As Joseph Goebbels, one of the architects of Nazism asserted: Repeat a lie often enough and it becomes the truth. Just as a mathematical error of the slightest fraction of a point can cause a major disaster, so an error in philosophical thinking can cause huge amounts of mayhem in the real living of our daily lives. This move from objectivity to subjectivity as the guiding frame of reference of our judgment regarding the real world has had, and continues to have, terrible consequences. What is growing in the womb is either objectively a growth or a growing human child. It cannot shift from day to day depending on the choice of the beholder. Perhaps our task as Americans is to debate the issue of when human life begins so as to have an accepted objective and commonly accepted point that marks the change-over from growth to child. The Catholic position is that it is at conception, since a new DNA pattern is guiding the development of the future child. But one can also make an argument for the presence of a heartbeat or brain waves or the ability to feel pain. This needs to be debated by those on all sides thoroughly before being enacted into law. Once the entity is passed that point, then it must be afforded all legal protection. The time for choice (from a Catholic point of view) must be before beginning the act that often results in the conception of a child. Once the child is conceived, then no one must hurt its progress. Both the father and the mother must be equally responsible for the welfare of the developing child. The mother must never be asked to shoulder the burden alone. At the basis of this issue, as in many other modern issues, is that aforementioned philosophical rule that must be acknowledged and abided by: the objective truth of material and spiritual being does in fact exist and that I, in my subjectivity, must conform my life and my decisions to its reality. That is our choice: do we stand with Pilate and question truth, or with Christ who is Truth? Share the post "End Times by Monsignor Ferrarese"
Our parish was a primary witness to an event that was seen by the entire city: what has been called the “Astoria Borealis”. Shortly after 9 pm on that fateful night, all the electricity in Astoria and beyond went off and on. As I went to the window and put up the shade, the street was lit up as in daytime. A low rumble could be heard. It was a sound like nothing I had ever heard. A terror ran through me: Was the tower of the Church on fire? Was that the source of the light? As I ran outside another possibility formed in my mind: terrorism? When I looked up 29th street, there was what seemed like a huge wall of white light two blocks away. It was at that moment the ultimate fear came upon me: I listened for the Archangel Gabriel’s trumpet of doom! The end of the world, like the end of our individual lives, is a forbidden topic. Even though we now have the capacity to end the world ourselves, we still pretend that the world is eternal, that our country is eternal and that we will live forever. What is eternal is God alone and our immortal souls. Therefore, it makes sense for us to show great care over these two realities. But, alas, we live in a time of disbelief. With no God and no souls, we are seen as biological accidents that have no surety or stable future. If the proponents of this godless theory truly believed that, then morality would go right out the window. Why be good? No one is keeping tabs. It is purely the survival of the fittest. And the backers of this view of life are called ‘enlightened’ or the ‘smart’ people! As believers, we have a more comprehensive, intellectually articulate way of seeing the universe and our daily lives. For us, everything coheres and is connected to God. We are responsible to God for our every action and even for our inactions. Transparency and accountability are part of our view of life—not theirs. We are all familiar with the dismissal of religion that was articulated by Karl Marx when he said, “Religion is the opium of the people.” By that, he meant that religion has been used by the upper classes to alleviate the hopelessness of the masses by a false promise of relief, like how a drug gives a false high for which the user will have to suffer more in the future. What has not been adequately expressed is the fact that the atheist has a way out of moral responsibility as long as he can get away with something without being detected. Since there is no god, there is no ultimate judgment and no final justice. There is no all-knowing being to whom we must render account at the end of things. So, if you can get away with something, you win! Disbelief, therefore, becomes the opium of the atheist! No heaven or hell for him; just the caught and the free. For the believer, everything we do has eternal resonances. Everything will be revealed by an all-knowing and all-judging God. I remember one of the Sisters that taught me in grammar school explaining the last judgment as everyone sitting in a huge movie theater and each person’s life, down to the most hidden and intimate details, would be shown on the screen for all to see. Everyone will see us with our hands in the cookie jar! That was a scary picture! But, it is essentially true. In this era of the importance of the transparent, God is the most transparent of all. So every detail in our life is important to God, and it should be so for us too since how we live day in and day out defines our life and makes us who we are. It is not the external circumstances of our lives that matter (i.e. how rich or poor we are), it is what we do with what has been given to us. Hence, our every moral (and by extension our every human) decision is noted and counted because they are ultimately important to who we are and what our eternal destiny will be. There is no escaping it. Life is morality and we will be judged and held accountable for all that we do. While we tend to look upon this statement with foreboding, considering the bad things that we are responsible for, it also works with the good that we do. Every act of kindness or generosity is noted by God and is also recorded. I rather think that we will be surprised at the judgment, not by all the evil actions we have done, but by all the good that we have done that we were not even conscious of doing since we did it automatically because of our faith. So even though the Astoria Borealis did not produce Gabriel’s summons, perhaps, when the end-times occur, we may be delighted in meeting our Lord and Maker and not be filled with fear. Share the post "Lost and Found by Monsignor Ferrarese"
One of the saddest moments of my Pastorate here at Immac was the day that I said goodbye to the Holy Union Sisters who served our parish for so many years. I knew the last car would depart that morning, so I called the other priests to join me in saying goodbye. The superiors of the Sisters were here to drive the remaining Sisters to their Mother House in Massachusetts. After embracing them, they got into the car and settled in, and drove away. We all knew that this was a profoundly sad moment in our history. These Consecrated Women Religious had served the parish for many years. They had educated thousands of children in the Catholic Faith. They had left everything and embraced a life of poverty, chastity and obedience. All this sacrifice for us! And now, advanced in years, they could no longer take care of themselves and needed more assistance. Reluctantly, they accepted the inevitable. After the car pulled out, I entered the silent Convent alone. I thought to do it for safety sake: to make sure that everything was off that had to be turned off, etc. But the real reason was that I missed them and wanted to hold on to the past. The rooms were silent with only the occasional car or truck heard on 31st Street. I went to the Chapel where the Blessed Sacrament was still reserved. As I prayed, I heard in my imagination the many prayers that were said by these great women in that now abandoned Convent. The moment of greatest poignancy was when I went to the Tabernacle to remove the Holy Eucharist, the Divine Presence from the Chapel and the Convent. Another historical moment was occurring. I could feel the great responsibility of carrying the Blessed Sacrament back to the Church. For decades, these holy women had been praying in that Chapel, offering their sacrifices for the good of the children that they taught, for their sisters in the community, and for our parish. As I turned off the light with the Blessed Eucharist clutched to my chest, I felt the great loss like a page turned for good. This sad moment apparently has been experienced in many parishes of the Diocese as the few aging sisters return to their Motherhouses. Soon, there will be so few women and men in consecrated life that it will be hard for our children, teens and even some young adults to be able to visualize these great witnesses to Christ. In growing up in the 50s, there were many priests and even more sisters in our parish of St. Rita in East New York. The Catholic presence in the neighborhood was unmistakably real and apparent. In looking around me today, I feel acutely the loss and the need in the future for a rebirth of religious life in our Church. Is that even possible? Yes, it is, and I believe that the roots of revival are in the ground, unseen. I feel hope for the future. It is so because the way of consecrated life is very beautiful and appealing when seen in its radical and world defying power. It relativizes not the way of God, but the way of this world, which in the long run cannot bear the weight of meaning that we give it. This transitory life cries out for another more permanent vision of being that can sustain the great hope that God gives us through our Christian Faith. It alone bears the symbolic majesty that the whole Church needs. Consecrated Life is a living signpost that points to the eternity that waits for those who are faithful to the struggles of our earthly life. It gives meaning and purpose to the journey that does not end in death, but through judgment leads us to the harbor of peace and love that we so long for in what is by comparison the desert of this life. These benefits will always be true and applicable to our life’s situation. These are perennial resolutions to humanity’s apparent conflicts and as such will always be needed by us in the Church. Our ecclesial imagination works on providing vibrant and compelling examples to spur the large and complicated diversity of the faithful to wish to live the virtues that they see manifested. The cult of the saints is such a dynamic. Not everyone is called to live poverty like St. Francis. A father or mother can’t just say to their children: Goodbye, Mommy is going to live a life of poverty, chastity and obedience! This would be horrendous and funny at the same time! But all of us will benefit from the example of St. Francis not to absolutize material goods and to strive to live simply. This can even make economic sense for a family to live by! We need Consecrated Life in the Church for this reason. It images for us the virtues we need to inculcate and live in this earthly abode whatever our station in life may be. The Sisters of the Holy Union provided that lesson for us in great splendor and in moving joyfulness. While we are in sorrow over their loss, I firmly believe that the providence of God will continue to raise up for the Church new forms of Consecrated Life that will enrich us with both traditional and new forms of living witness. Share the post "The Gathering Storm by Monsignor Ferrarese"
As wonderful as our country is, we have made some serious mistakes in our history: slavery, the isolation of Native Americans, and the internment of Japanese Americans. But the thing that will, I believe, go down in history as our lowest moment is the killing of innocent American children in the womb. This is not an isolated occurrence, but a planned and legalized extinction of developing pre-born infants in savage and reprehensible ways. Like the Nazis who used words to pretty up their nefarious deeds (calling the handicapped “life unworthy of life”), we casually speak of ‘Reproductive Rights’ and ‘Women’s Health’. Who can possibly be against these? But the fact of the matter is that abortion is the most anti-woman thing imaginable. An invasion of the womb to tear out the life within it. For this reason, the Woman’s Movement that years ago gave us universal suffrage was adamantly against abortion. They saw it as a male solution that imposed on the rights of women and their special dignity as the bearers of life. This intimate connection between pregnancy and the very being of the woman is underneath the salutary reminder that it is the woman that bears the burden of bringing life into the world. It is what is most distinctive and unique about women. Pro-choice advocates do emphasize this central fact, and it gives power to that movement since it locates the decision to continue the pregnancy in the private decision of the woman. But like all truths, it must be put into the context of the consequences of that decision since it affects another life. We often forget that we were all once fetuses and, while the burden of bringing life into the world falls almost completely on the woman, there are other ways to exercise freedom. Hence, the place for true choice is at the time of sexual intimacy, for every sexual act bears the possible responsibility of new life. That is the true moral locus of choice, and both the man and the woman must make it. There can be no love, no action, without responsibility. Like all moral choices, the choice to engender life, whether directly willed explicitly by a married couple wanting to bring new life into the world through their love for each other or indirectly bundled into the desire for the pleasure or ecstasy of the marital act, has political consequences. When a new reality begins through the union of sperm and egg, complete with an entirely new genetic substructure of DNA (Conception), this has political consequences and is not simply a private act. Once this new reality, which in our faith as Catholics we recognize as a human being, then this realization ushers in many rules and protections that must be accorded it. This is where a lot of the difficulty lies in the Abortion wars. A woman’s body is truly a private and personal reality to the woman herself. But what has begun within her body is not just about herself. There is another who is being formed. There is also the husband who has ‘invested’ himself in what is meant to be a joint venture. But it is the woman that must bear the often painful living-out of that development within her very body, where the personal is most evident. So that is why the highest care must be provided for the mother of the developing child. Moreover, we cannot understand the proliferation of abortions outside the context of the sexual revolution. Because it now seems almost a right to be able to do sexually whatever one wants (God’s commandments do not seem to have any impact! ), then if Birth Control does not work you have to be able to stop an unwanted pregnancy whatever the cost. Unfortunately, the cost is borne by the pre-born child. Added to this conflict-filled problem is the fact that we have legally never defined when human life begins and when those beings need legal protection. Is it at conception (the Catholic position), or when the child feels pain, or when there is a heartbeat or when there are brain waves? We know when someone is dead: no heartbeat, no brain waves; but the beginning of life is left up to the subjective decision of the mother. Conceivably, a child can be seen as a someone who is already part of the family (my baby) and then later in the week, merely a bothersome group of cells that can very easily be discarded. How can one’s own decision to see something one way or the other alter the objective reality of the thing? All these issues must be calmly reasoned out. Unfortunately, that has not happened. Both sides are fixed and the decibel level is high. But there are good and sincere people on each side. We need to keep the discussion on grounds that everyone can accept, both religious and non-religious. So we need to talk in terms of reason and how to best build a civilization where everyone can find a place and where reason and science is respected. As believers, we must bring the insights into human relations that our faith bestows upon us. We come with a richness that does not negate science, but supports it. Otherwise, things will get worse and this gathering storm will bring with it destructive possibilities that will make reasoning no longer possible. Share the post "Paradise Lost by Monsignor Ferrarese"
We all like progress, and as Americans we are always in love with the ‘new’, but we seldom count the cost of that modernization. My Mom eventually won the battle and we got the family toaster. But my father’s ideas were cautionary and had certain validity. It is not a good thing just to buy something because everyone has it. Now, I am not against toasters! But when we look at all the gadgets we have around (even extending to the hightech), I wonder if my Dad did have a point. This is especially true when we are trying to get rid of the things that don’t work anymore. There is a beauty in simplicity. Now that we have a thousand channels on TV, are we any happier? And what have we lost: reading time, time to converse with our families, opportunities to think and to pray, and that delicious silence that has a healing presence in our souls! I love telling the Academy children when I visit them in class what it was like to grow up in the 1950’s. When I give them the particulars (no remotes, 6 or 7 channels on TV, no cell phones or computers), they look at me like I was a Cave Man when I grew up! But when I tell them about the safety in the streets, the long languorous summer days with the ‘gang’ on the block, the invented games like Kick the Can, the unsupervised trips on the Subway to Yankee Stadium, they sort of begin to see that they are missing something that we had, something so mysterious (community!) that their isolated connections on the Internet can’t even begin to approximate. Perhaps the song was right: we paved paradise and put up a parking lot. Maybe we needed parking, but how can we calculate what we have lost? At the center of this real community was the Church. I grew up in St. Rita’s parish in East New York, Brooklyn. Our Church, humble as it was, was actually an underground building that was initially intended to be the first stage of a larger, more imposing edifice; and the large school building with its adjacent Youth Center was often at the nexus of all our concerns. We went to school there, we worshiped in the Church that was seemingly always open, and we played ball in the ‘Marian Yard’. In the Convent there were 20 to 30 nuns in full habit, members of a strict contemplative order named the ‘School Sisters of Notre Dame’. The rectory had 4 to 6 priests assigned to our parish. Twice a year we had a giant feast and bazaar. The first was in June dedicated to St. Michael and St. Joseph, run by our Neapolitan parishioners. The second was in honor of Saints Cosmas and Damian and was staffed by our Barese parishioners. In this Italian-American neighborhood, there was great respect for the priests and nuns even though we saw them as flawed human beings. But the faith was central and it informed our lives in many often-imperceptible ways. This solidity was mirrored at home by the strong family structures we enjoyed and often put up with! Today, we have a great deal more technologically. And, if we are honest, we would not easily give up our smart phones, our material prosperity and the remotes we use to run our lives. But it has come at a deep price. We have paved paradise and we like the expanded parking. But at what a cost! Maybe it is better that the younger amongst us do not realize this and blissfully think this the best of all worlds! After all, there were some terrible injustices that we accepted without understanding what we were doing. I think of the racism and the restricted role for women. And I am sure we have many blind spots today (abortion as reproductive freedom). But there were things that we have lost, and maybe will never see again. Even with these losses, God is still at work; and every time that we fulfill His Commandments and live a life of faith and love, we incarnate the essentials that make for future paradises. For our faith is constantly renewed, and we are taught by God through detachment to let go of even the glories of the past, for He is always making all things new. Maybe the Paradise we are moving toward in God’s providence will far our shine the ones of the past. We are a people of hope as long as we put God first in our lives. Share the post "The Feast of the Magi"
“When Jesus was born in Bethlehem of Judea, in the days of King Herod, behold, magi from the east arrived in Jerusalem, saying, ‘Where is the newborn king of the Jews? We saw his star at its rising and have come to do him homage.’ When King Herod heard this, he was greatly troubled, and all Jerusalem with him. Isn’t this the Feast of the Epiphany? Yes, it is. It’s also called the Feast of the Three Kings and is known by a few other names. Whatever happened to that feast? The Epiphany is traditionally celebrated on the 12th day after Christmas, January 6th. In the United States, the feast has been moved to the Sunday between January 2nd and January 8th. What does the term epiphany mean? According to Merriam Webster, the term epiphany is defined as “a sudden manifestation or perception of the essential nature or meaning of something usually initiated by some simple, homely, or commonplace occurrence or experience”. What do we commemorate or remember on this day? On this feast, we commemorate the manifestation of Jesus to the whole world. Jesus is revealed to the magi who have come from the East bearing gifts and are the first individuals from the Gentile world to see or encounter the Savior of the world. Share the post "The Feast of the Magi, continued"
“Like many of the most ancient Christian feasts, Epiphany was first celebrated in the East, where it has been held from the beginning almost universally on January 6. Today, among both Eastern Catholics and Eastern Orthodox, the feast is known as Theophany – the revelation of God to man. Epiphany originally celebrated four different events, in the following order of importance: the Baptism of the Lord; Christ’s first miracle, the changing of water into wine at the wedding in Cana; the Nativity of Christ, Christmas; and the visitation of the Wise Men or Magi. Each of these is a revelation of God to man: At Christ’s Baptism, the Holy Spirit descends and the voice of God is heard, declaring that Jesus is His Son; at the wedding in Cana, the miracle reveals Christ’s divinity; at the Nativity, the angels bear witness to Christ, and the shepherds, representing the people of Israel, bow down before Him; and at the visitation of the Magi, Christ’s divinity is revealed to the Gentiles – the other nations of the earth. Eventually, the celebration of the Nativity was separated out, in the West, into Christmas; and shortly thereafter, Western Christians adopted the Eastern feast of the Epiphany, still celebrating the Baptism, the first miracle, and the visit from the Wise Men. Thus, Epiphany came to mark the end of Christmastide – the Twelve Days of Christmas, which began with the revelation of Christ to Israel in His Birth and ended with the revelation of Christ to the Gentiles at Epiphany. Over the centuries, the various celebrations were further separated in the West, now the Baptism of the Lord is celebrated on the Sunday after January 6, and the wedding at Cana is commemorated on the Sunday after the Baptism of the Lord. BTW, what is a magi? Oh, and how many magi were there? The term “magi” is the plural of magus. You can see the root of magic and magician in the word. The magi were a priestly caste or class from ancient Persia. A magus, the singular, was an expert in the sciences of the time, especially astrology. How many magi were there? We don’t know because Scripture doesn’t give us a number or their names. We say three due to the gifts of gold, frankincense and myrrh mentioned, but over history the number has varied, once there were as many as twelve. What are their names? Do we have any relics of them? Traditionally, from the 6th century on or so, the names Caspar, Melchior and Balthasar have been associated with them. 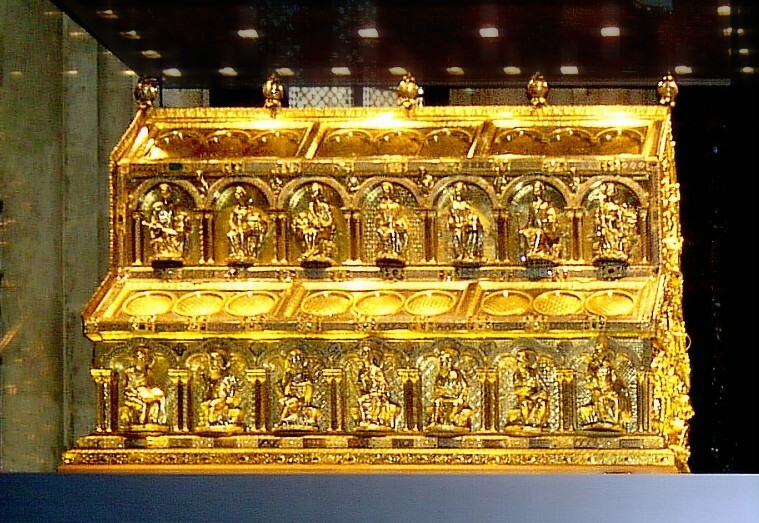 According to tradition, the relics of the Magi are at the Shrine of the Three Kings at Cologne Cathedral. What are some activities that we can do participate in on this day as a family or as a faith community? The Catechism of the Catholic Church. New York: Doubleday Press, 1997. Catholicism.About.com http://catholicism.about.com/od/holydaysandholidays/p/Epiphany.htm. 2014. Web. 25 Dec. 2016. CatholicCulture.org http://www.catholicculture.org. 2014. Web. 13 Dec 2014. Merriam Webster http://www.merriam-webster.com/dictionary/epiphany. 2014. Web. 12 Dec. 2014.